/ What is the best pull up bar for home? Pull up bars are often one of the first bits of home equipment people go for, especially the door frame version. They can be really unobtrusive and allow you to have a quick workout whenever you pass so of course they are very popular. So what is the best pull up bar for home? 1 What are pull up bars good for? 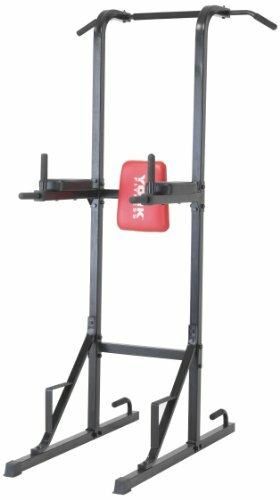 3 What is the best pull up bar for home use? What are pull up bars good for? Pull ups are great for all sorts of upper body muscles and for developing a strong core. By varying the width of your hands while doing pull ups you can target different muscles but generally you’ll be working your lats, biceps and forearms. You can do more than just pull ups with a bar though – why not try some leg raises. While you’re holding on to the bar, curl your knees up to your chest and lower back down. This will work on your abdominals and lower back. You need to think about the space around you when considering a pull up bar. Where is it going to go and will you have enough space to do an adequate workout around it. Consider as well the fact that some door pull up bars can cause damage and if you’re in a rented house, or just would like to minimise the impact that you need to bear that in mind. If you have lots of space, for example in a garage or a spare room then a free standing pull up bar might be a good option. Again, make sure that you’ll have enough space to use it effectively. A wall mounted bar could be fixed to an outside wall but of course means that you might not be able to use it in bad weather. 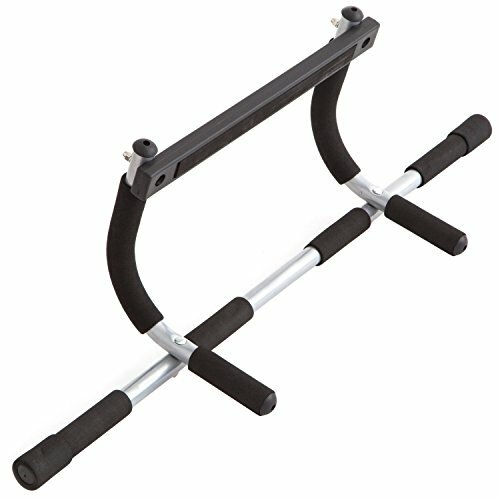 What is the best pull up bar for home use? With the above thoughts in mind, here’s the best pull up bars on the market in all of the different categories right now. This is a great bit of kit to have in your home and a really great price too. For someone on a budget or someone just starting out building a home gym it’s a great addition. 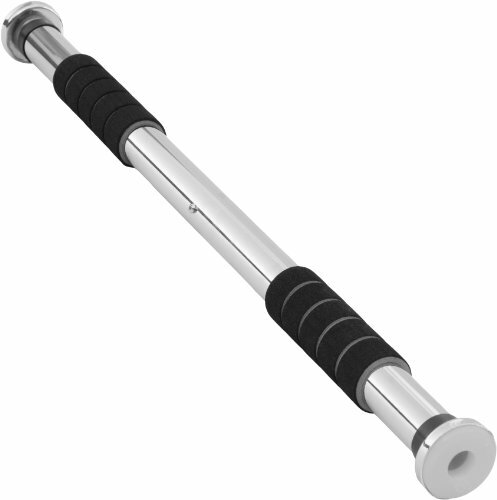 It’s a multi exercise bar and can be used for not only chin ups but also for dips, sit ups and push ups (when not attached to the door – it can be easily removed and used on the floor for these exercises). Check out this exercise bar here. If you just want a traditional door pull up bar then this chin up exercise bar from Ultrasport is a good option. It has a telescopic system which means it can fit almost every doorway and with rubber pads means it won’t mark the internal frame. If you want you can attach it permanently with the metal fixings if you’re worried about it coming down. It’s a really good item and comes well recommended by many people on Amazon who are impressed by how sturdy it is. You can read the reviews and see the latest price on Amazon here. 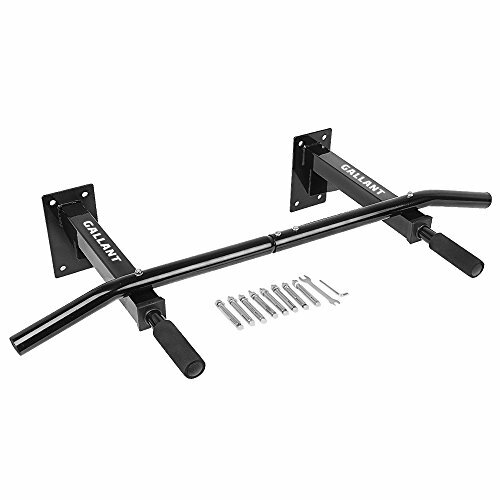 This is a really sturdy chin up bar despite being one of the cheapest around. It fits well to either an indoor or outdoor wall although with some slight DIY required obviously. If you want something in a dedicated gym space this is an excellent buy. These come with a much higher price tag than the above options but for a more serious option they do the job really well. 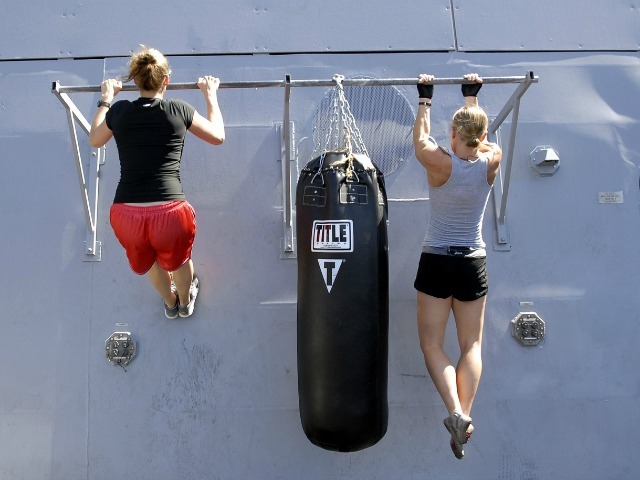 They not only allow you to do pull ups with plenty of space round you (no hitting the wall) but they also allow you do dips and also push ups using the handles at the base. It is made by York which is a really good brand for fitness equipment so you can be sure it’s good quality. See the latest price and more reviews on Amazon here.